1 In small bowl, combine Hellmann's® or Best Foods® Real Mayonnaise, garlic, basil, oregano and black pepper. 2 Brush cut side of bread with 1/2 of the mayonnaise mixture. Grill or broil 2 minutes or until golden brown. Remove and set aside. 3 Brush zucchini with remaining mayonnaise mixture. Grill or broil, turning once, until crisp-tender, about 2 minutes. Slice. 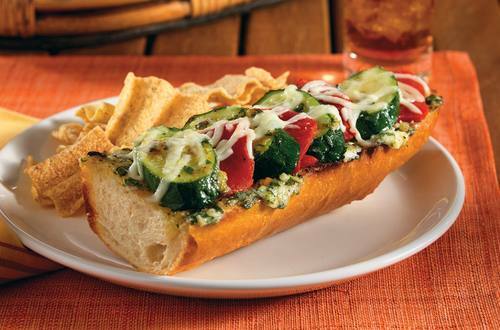 4 Top each slice of bread alternately with zucchini and red peppers; sprinkle with cheese. 5 Grill or broil 1 minute or until cheese is melted.